For holiday, or even for just a normal day, everyone wants themselves to look lovely. Whether it be clothes, shoes, hair, make-up or nails. With nails, you could just paint them one block colour like pink or red, or you could go a little more out there with metallic, neon or pastel colours. Even more out there... french manicure in lots of different colours, fake nails, like gel nails which are semi permanent, acrylic nails, or self adhesive glue on nails in thousands of colours and lengths. 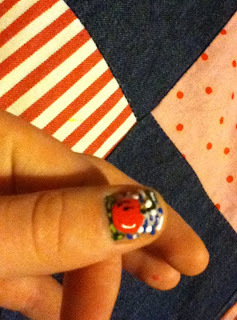 But my favourite of all, is when you paint your own nails with patterns - things like the flags of your country, or hearts and stars, or strawberries. 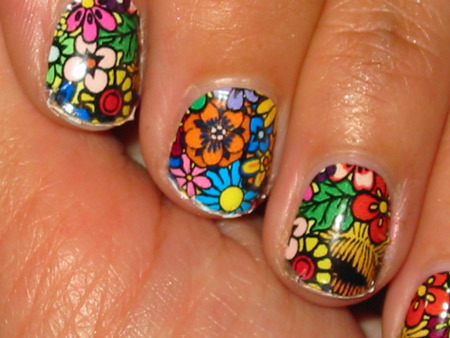 to do this, you need to have special applicators for your nail varnishes. I mean, aren't they just fantastic! My nails for the Royal Wedding! 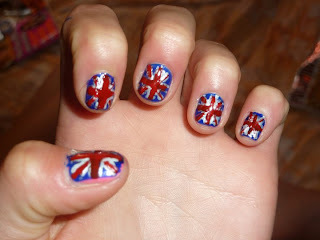 For holiday this year my mum and I are going to get our nails done in a salon, acrylics or gel nails. I haven't decided what I'm going to get yet - I can't stand my nails being too long and I don't want them to look cheap and chavvy. I am looking for a classic chic look, so I was going to get acrylic french manicured nails, what does anyone think? 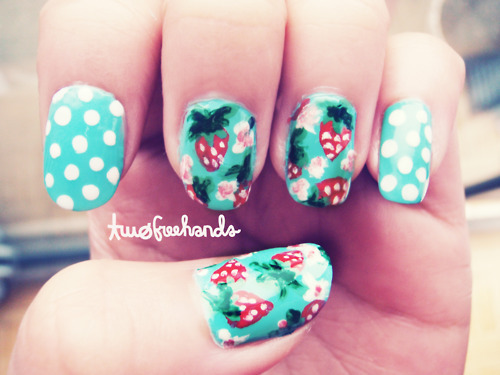 i would love to be able to do something like this on my nails! It's not that hard actually, even though it does look hard. You can buy special applicators for the nail varnishes - they have needle-like things on the top, which allows the varnish to come out in tiny amounts in straight lines. I'll find out for you- but they come with the nail varnishes. I'll speak to my friend and get back to you! 2) put them in the fridge for about 30 mins... makes applying the polish very much easier as it's not sticky. 3) wash the brush until there is no nail varnish on the brush at all. 4) cut the brush in half long ways so it's really small.. If you don't want to cut a perfectly good one, you could always cut an old fine paintbrush instead, or an old brush saved from an empty bottle. 5) This way you will find it very much quicker and easier to apply the polish.